Breakfast just got fancy y’all. Fancy but not fussy. In the last nineteen days since Felix was born I have eaten my fair share of belVita Breakfast BiscuitsÂ but this morning after I shared my breakfast biscuit with Kasper I decided I needed something more. Something that would pack a nutritional punch and keep me full until lunch. 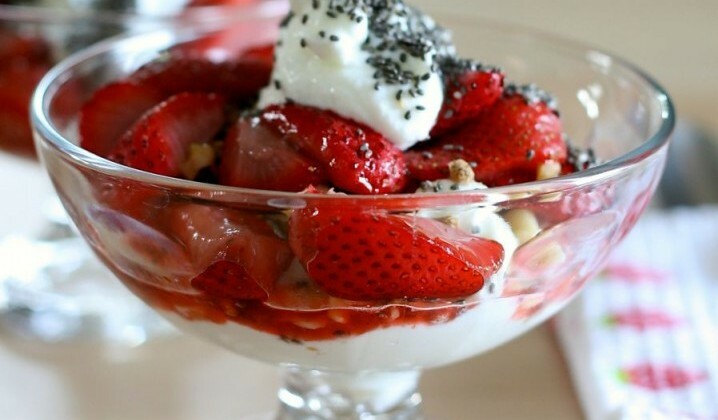 This parfait is satisfying all those needs. Like I said this is not fussy at all. It is so not fussy that I really wouldn’t need to type up a recipe. But sometimes it is fun to share non-fussy recipes. Especially when they are as delicious as this. I roasted the strawberries for a little something different. Roasting strawberries brings out the juices and strawberry flavor while keeping the fruit fairly firm. Drizzling that sweet strawberry juice over the yogurt made my stomach growl. Plus it smells so darn good too. The strawberries roast for about eight minutes. Which is long enough to make a pot of coffee and switch over a load of laundry. You can let the strawberries cool slightly before serving but I couldn’t wait I topped my yogurt almost immediately. My parfait is full of good for you nutrients too. I used fat free plain Greek yogurt (I am partial to Fage Total 0%), chopped walnuts, Bran Buds, and Chia seeds. Protein, fiber, and some omega-3s are all important nutrients this postpartum breastfeeding mom needs. Fuel like this is what helped Felix gain one pound in the last week. He is seriously packing on the pounds! 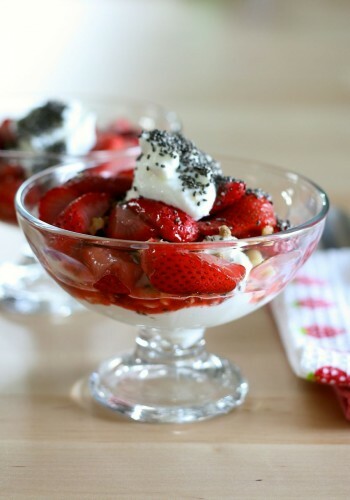 Substitute your favorite yogurt, nuts, cereal or granola (my recipe), and seeds to make this tasty parfait yours. Serve for breakfast or dessert. These parfaits could easily be mixed up in those oh so trendy Mason jars for a breakfast treat you can bring to work. Preheat oven to 425 degrees F. Line a baking sheet with parchment paper. Set aside. Toss strawberries with sugar and vanilla. Spread in even layer on baking sheet. Bake for 8-10 minutes. 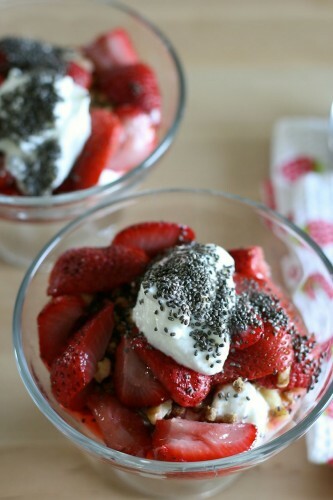 In a small dish place half the yogurt, Bran Buds, walnuts, strawberries, and Chia seeds. Repeat for other serving. These parfaits are going to be on my mind all day now! Exactly the type of dessert I like. I usually do some and I sometimes add ice cream also. We are living in the hay field once again. Grilling every meal. Have you ever roasted the berries on the grill before? I love that granola you added to it, makes it more hearty. Also, it looks DELICIOUS!